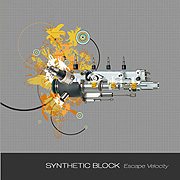 Escape Velocity (63'26") by Synthetic Block presents six tracks of Prog-Rock influenced Spacemusic. While this album's plot is familiar, the execution is lively, detailed and clever. Lyrical synth lines recall a time when Contemporary Electronic Music was pre-occupied with melody rather than texture and performers strove for a clean sound and hands-on control. The arrangements on Escape Velocity are linear and elaborate enough to continually engage the listener (without all the bluster of Block's explicit influences). However, with classic Mellotron sounds, manipulated acoustic samples, pulsing electronic percussion and vintage synthesizer voicings, the instrumentation becomes quite luxurious. The overall effect is a spacious elegance in which Block confidently produces a gravity defying mixture of cosmic pastorale and post-Art Rock electronics.